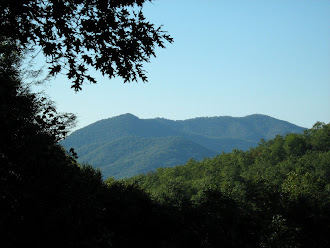 ...it made me appreciate the fact that we live the midst of the impressive Southern Appalachian mountains. Surrounded by beauty, feeling on top of the world and at the same time seeing just how small we are in comparison...not in a negative way, just reality. ...but to come across a piles of lumber just tossed over the mountain's edge made me angry...if logging companies are going to cut the trees, then every single one should be used as intended and not discarded to rot. In honor of Dr. Martin Luther King, Jr, I'll share this quote of his..."It really boils down to this: that all life is interrelated. We are all caught in an inescapable network of mutuality, tied into a single garment of destiny. Whatever affects one destiny, affects all indirectly.” The logging industry might want to think about this. Beautiful hike. Yes, we also hate to see such cutting on the mountains and we only hope the money is used for a good purpose. Nicole is my sensitive child and honestly when we are out and about, if we drive by an area that has been cleared for more building, she cry's and ask about all the animals that are now homeless!I have always told her, she can be the one to change all of that! I don't even walk 1/2 mile to get my mail and newspaper! Loved the hike along with you. Hugs! NCmountainwoman, I'm not even sure where the money actually goes! Do you? Patti, it was so pleasant I didn't even realize how far it was. I plan on doing it again!